For the larger grouping of Scottish islands that includes all of Shetland and Orkney, see Northern Isles. The North Isles are the northern islands of the Shetland Islands, Scotland. The main islands in the group are Yell, Unst and Fetlar. Sometimes the islands in Yell Sound are included in this group. They are a significant group, since Yell and Unst are the second and third largest islands in the archipelago, and also the third and fourth most populous (Whalsay, which is not in the group, is the second most populous). Combined, their total land area is far larger than the rest of the Shetland Islands (excluding Mainland) combined. The group also contains the most northerly land of the United Kingdom and Shetland at Out Stack near Muckle Flugga, and its most northerly settlement Skaw on Unst. These also happen to be the most northerly British territorial claims currently in existence, since Canadian independence. In similar fashion, Britain's most northerly maritime claims are also based on these islands, having great effect on its fishing and oil industries. Fetlar also contains some of the most easterly points of Scotland with the exception of the Out Skerries, and much of Fetlar and Unst are under 350 km from Norway. Travellers do not encounter any further land masses between Out Stack and the North Pole if heading directly north. 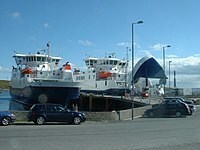 The regular ferries are the most northerly scheduled routes in the British Isles (excluding those going to the Faroes and Iceland). They run between Yell and Unst, Yell and Fetlar and Yell and Mainland. ^ "Haroldswick Methodist Church, Unst". Scotland's Churches Trust. Retrieved 27 February 2013. ^ Blackadder, Jill Slee (2003). Shetland. Colin Baxter Island Guides. Strathspey: Colin Baxter Photography. ISBN 1-84107-125-0.